The on site facilities include tennis and volley ball courts, nature and cycling trail and two children’s play areas. The club house has complementary internet access, a fitness room ,Sauna, coffee lounge, communal pool , spa and tiki bar. 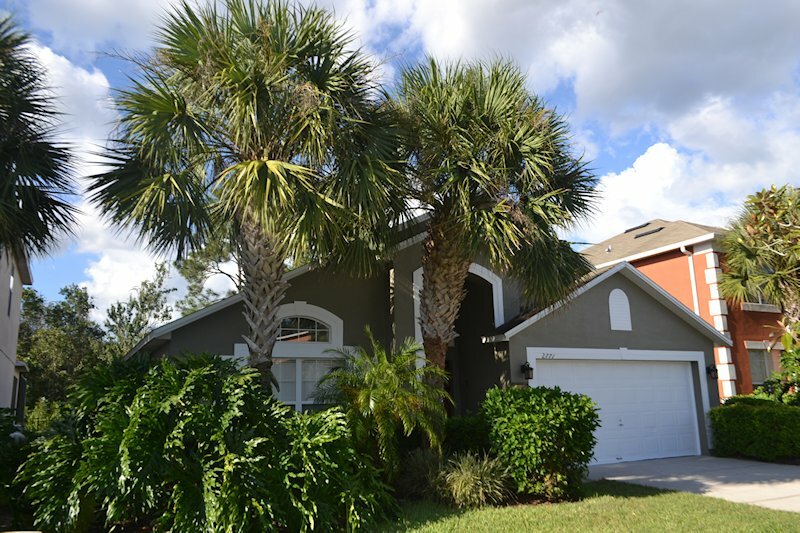 All this and only a 5 minute drive from the Disney complex and 2 mins. from the major highways for those trips further afield. The new Margaritaville Resort is under construction from 2017 and Emerald Island will be one of the closest resorts to it giving easy access to what will become a very popular major complex with a massive range of popular attractions and facilities. This beautifully decorated luxury home newly refurbished in May 2017 is situated in a quiet road and backs onto conservation woodland for added privacy around the pool. 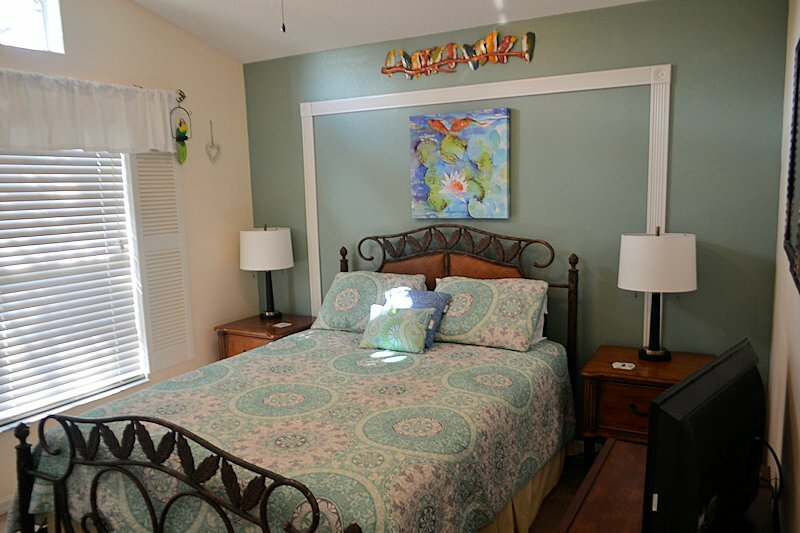 Light and airy and maintained to a high standard with all new Mattresses in 2016 the villa is the perfect place to relax and enjoy all the atmosphere and amenities Florida has to offer. Every effort has been made to include everything you are likely to need for a comfortable vacation, from travel adaptors and hairdryers to board games, books and a selection of DVD’s. Although fully air conditioned all the bedrooms also have ceiling fans for added comfort. 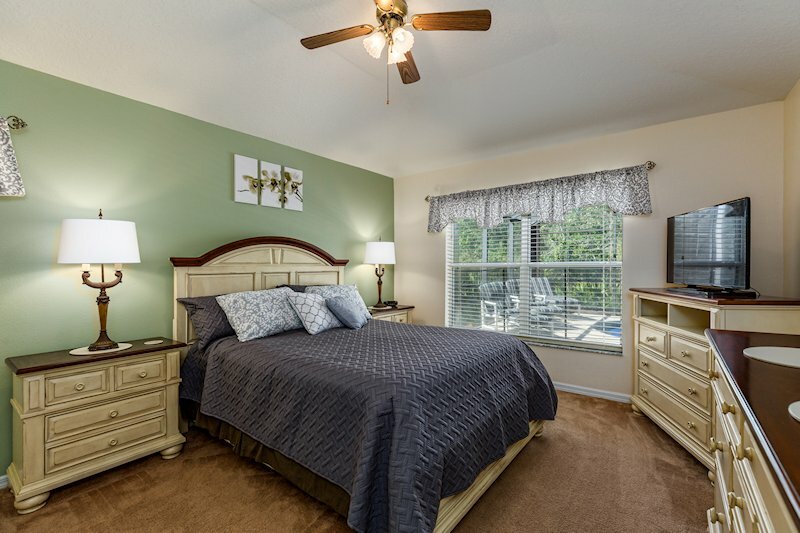 Both master Bedrooms and the Queen Bedroom have TV’S and alarm clock radios. 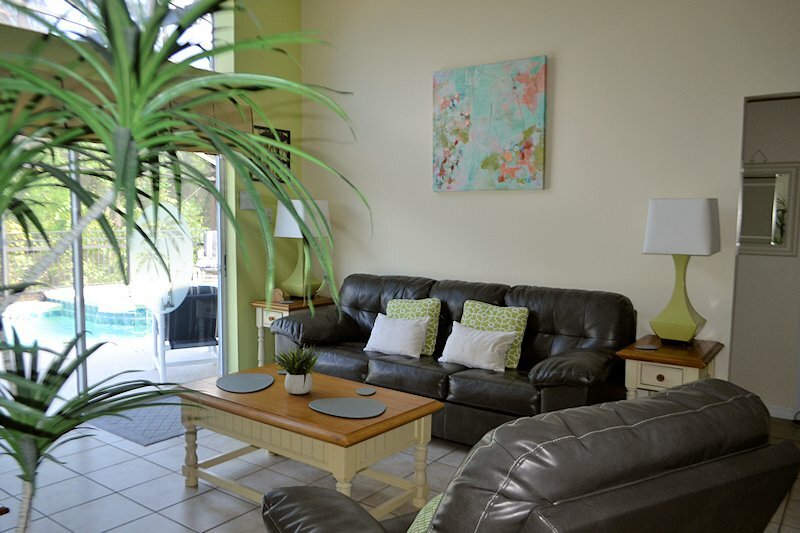 The villa also has wireless internet and is fully baby friendly with everything from sterilisers to strollers. 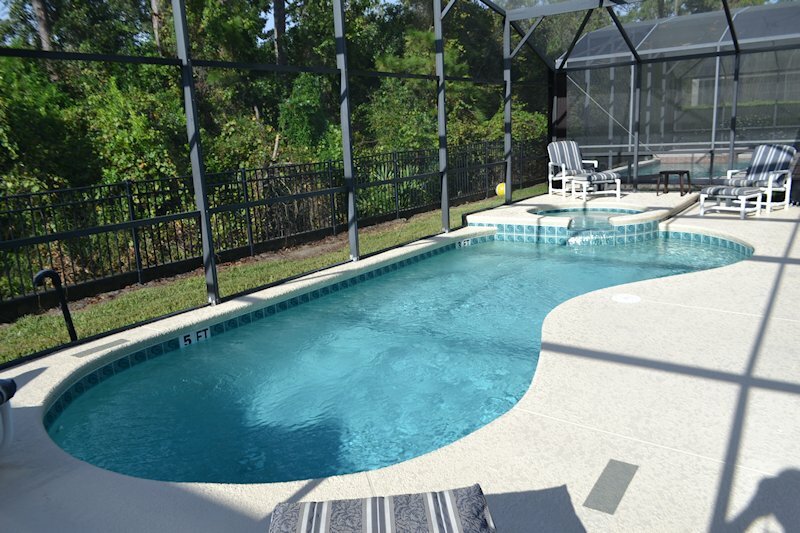 Take a cooling dip in the Pool or relax and enjoy a steak on the BBQ with a glass of wine. However much you enjoy your days out you will always be pleased to return to Emerald Gem. Broadband Wireless internet access is now available within the villa with free calls within the USA and Canada. "A lovely villa and a nice resort. We had a wonderful time and enjoyed the pool and games room so much it was often a problem getting the children out of the door to go out. We are already saving to stay here again and cannot wait. Thank you for a lovely home. Teressa Paul Alan and Emily Gillingham uk "
"Thanks Dave and Ellen we had another great time in the villa and all your tips made it even better than last time. We loved the new furniture and the new decoration and can't wait to come back. The kids cried when we left and we could happily have stayed for another couple of weeks. Thanks for all your help Naomi John Ruben and Ethen." Our booking dates are flexible allowing the option of being able to travel using off peak midweek flights. You may book for any number of days although stays of less than one week will be surcharged for short term cleaning. As you open the door to Emerald Gem you will find the Family Room with twin Sofas, a large screen TV and a Sony surround sound system. The ideal Room for adults to unwind away from the heat of the day or the kids being noisy in the Pool. 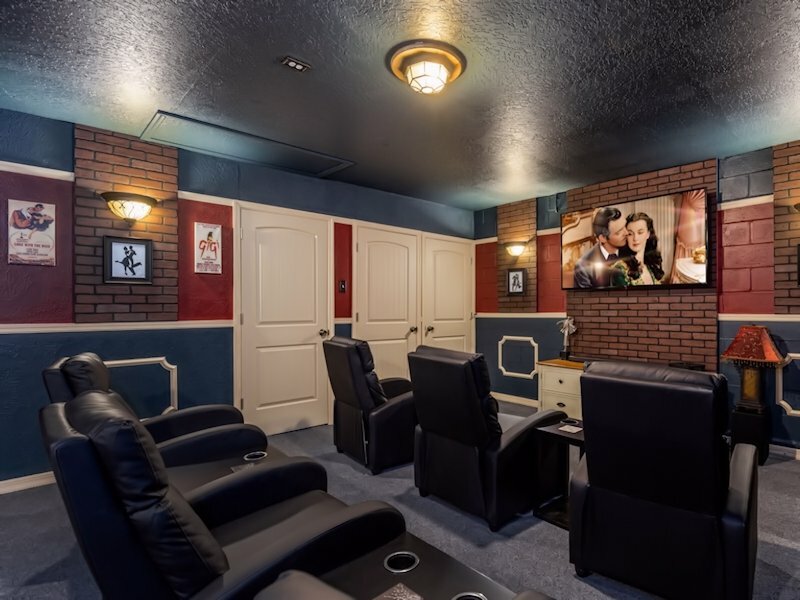 To the right and newly built during Feb. 2019 is a Movie Theatre Room with a 65 inch TV, Blueray DVD player and Soundbar all by LG and of course reclining chairs with Tables and Cupholders. There is a selection of DVD movies or bring your password and use Netflix or Amazon on the Smart TV. To the left we have the Queen Bedroom with a 5ft. Double Bed, TV and cupboard with ample hanging space. Continue on and the Family Room to the left has twin Sofas, a large screen TV and a Sony surround sound system. The ideal Room for adults to unwind away from the heat of the day or the kids being noisy in the Pool. Turn right into the Bath/Shower Room and onto a Master Bedroom. A quiet Room with the same facilities as the Queen Room. 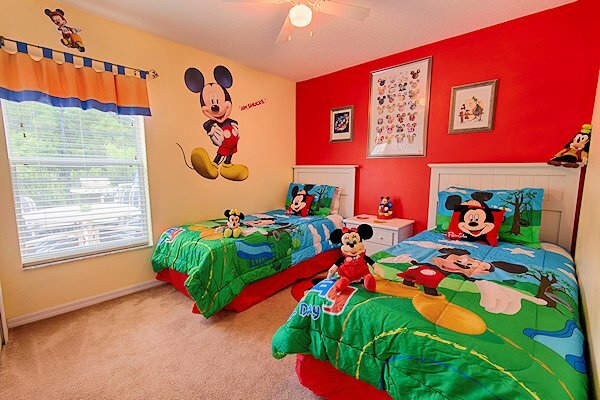 Along the Hallway are 2 Themed Twin Bedrooms sharing a Jack and Jill Bathroom. Mickey themed of course. Younger children will love the Disney Room and the older ones the Jungle Room. More extras are planned here in November 2014. These rooms are both close to the Master Bedroom so small children need not be far from Mum and Dad at night. 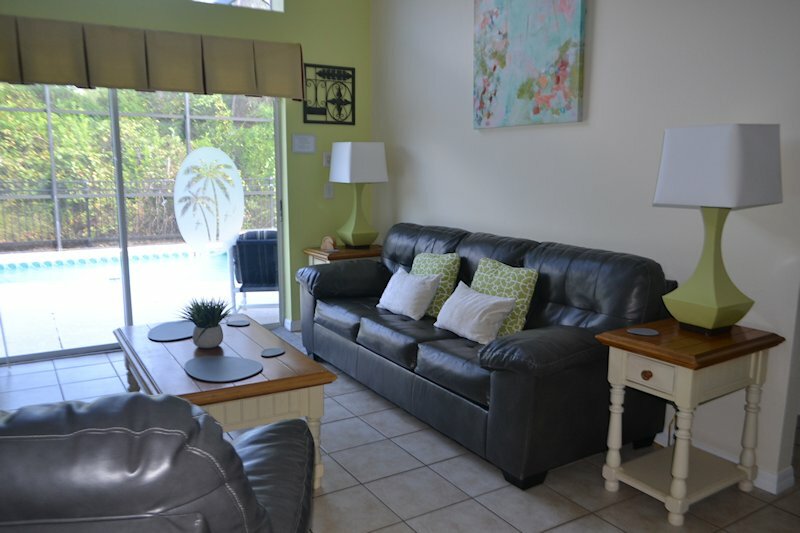 Left into the main Family Room and sink into the Sofa or the fully reclining chair overlooking the Pool and Deck area. 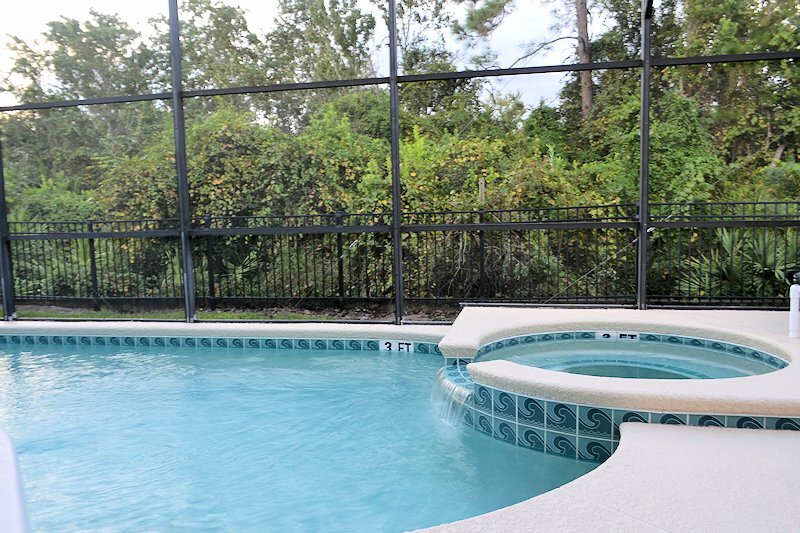 Enjoy the view over the Pool into lush woodland. Here you may enjoy a Movie or just watch one of the many TV channels. 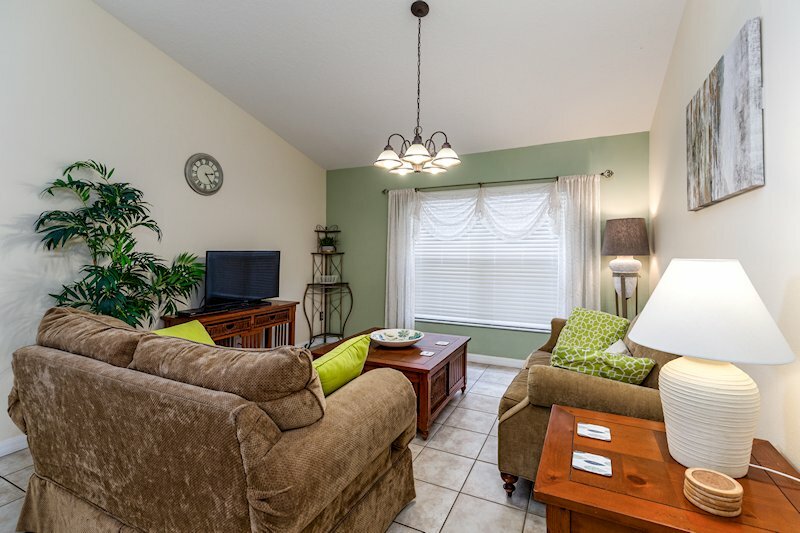 From the Family Room stroll into the spacious Master Bedroom and Bathroom with walk in Shower and Roman Bath. 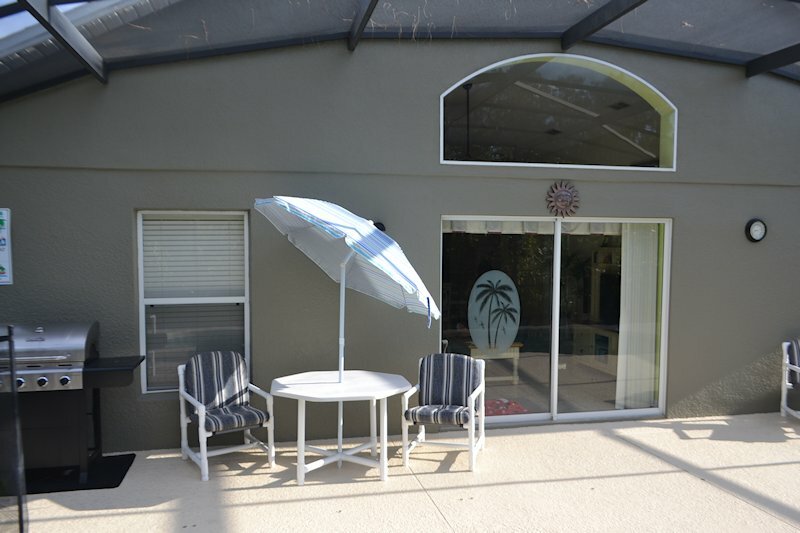 The fully equipped Kitchen is situated in the centre of the home next to the Dining Nook with a six seat Table and Chairs, although the chance of you eating indoors is a bit slim when you can enjoy the Florida sun outside or the cool of the evening with a BBQ . Relax with the Grill and BBQ. The Pool may be heated in the cooler months and the Spa has the added advantage of a rapid heat facility for those evenings when the perfect day can be rounded off with a soak in the Spa. There are Loungers, Chairs and a Table on the Pool Deck. 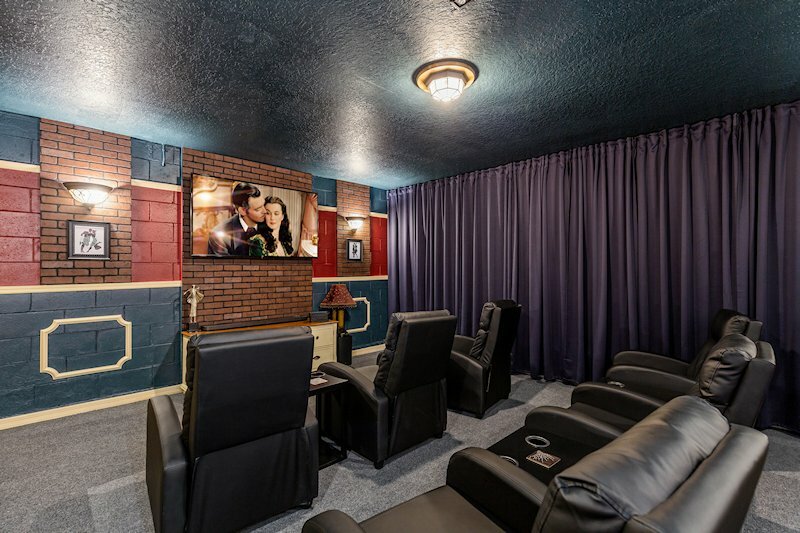 The Retro Movie Theatre has been created in Feb 2019 as a space to watch a movie in relaxed surroundings and is perfect to entertain the younger generation while mum and dad are getting organised. 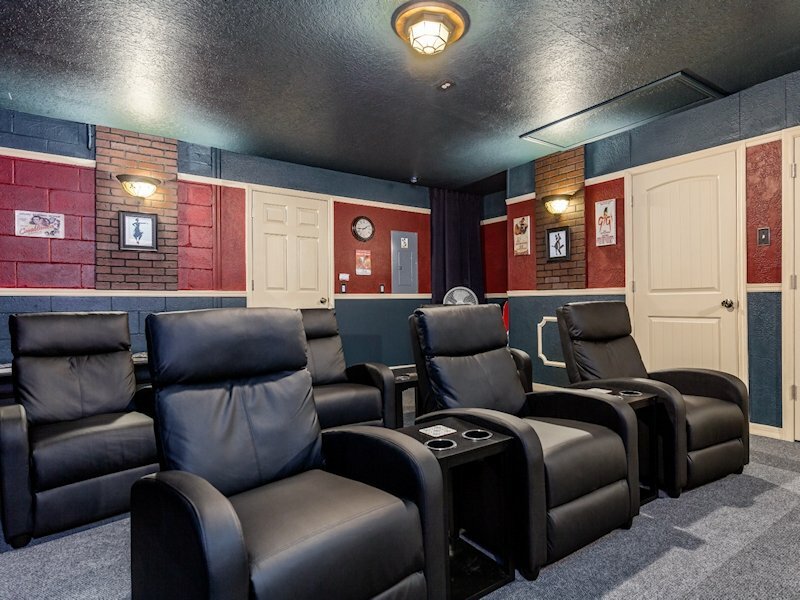 The perfect place to spend some time relaxing but often trying to stay awake in the reclining chairs.